Broken Tail Rescue | Adopt Today! What Is Broken Tail Rescue? Broken Tail Rescue, Inc. is a 501(c)(3) nonprofit animal rescue organization run by a group of dedicated volunteers in Massachusetts. We save dogs and cats from euthanasia and find them loving, happy homes. We focus on local animals in the New England area primarily, but we also assist southern dogs when space permits. If you are looking to adopt a dog or cat, look no further! Help Broken Tail Rescue Save More Animals by Fostering! Because Broken Tail Rescue does not have a shelter, we rely solely on our foster home network to provide a safe and stable temporary home to get them ready for adoption. It’s simple: the more people who open their homes for fostering, the more animals we can save. It’s a rewarding way to give to our organization and it’s a critical part of what we do. Most importantly, it’s fun! For more information, please visit our volunteer page. Donate – There are many ways you can donate, all donations are greatly appreciated and every little bit helps! Foster an animal – the more foster homes we have, the more dogs and cats we can save! Come to our local events throughout MA. “Like” us on Facebook and spread the word to your friends about us and our adoptable pets. And of course, adopt a dog or cat! There’s one waiting just for you! There are many ways you can donate, all donations are greatly appreciated and every little bit helps! A great-looking shirt that helps a great cause! I’m a a handsome, energetic, orange fellow with extra toes who loves to hunt toys, purr loudly, and watch people cook. I’d love to meet you! Hello! I'm Candy, My name suits me because I am so sweet! At 10 years old and 15 pounds, I am a great choice for apartment living and would be an ideal companion for a retired person or someone who works from home. Check out my profile! Read more here and apply to adopt Candy! 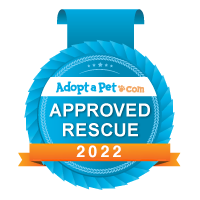 © 2017 Broken Tail Rescue, Inc.